We typically write about WordPress and all things web. But the past few weeks, we’ve been working on a very special week. And this coming weekend, I’ll be showing this project with my collaborator, Eleas Kostis – artist extraordinaire – and owner of Praxis Design at Maker Faire! Woohoo! Below is some initial documentation for the project. Here’s the Project Space on Eleas’ site. So – what does our project “do” ? 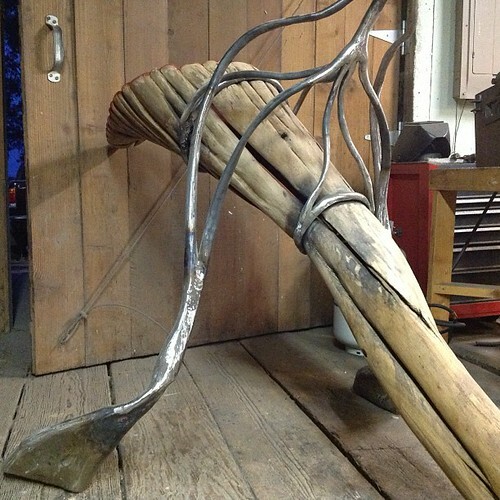 Well – as of now, it’s a interactive wood.metal network of sculptures. As you approach any one of the sculptures, the lights on the sculpture change. We’ve made an effort to document things as we go, so below is some documentation on how the electronics part of things work. To start, we are working with Arduino’s, some LED strip lights, a PING Sensor, and some XBEE’s. To get going, we downloaded the latest versions of Processing (http://processing.org/download/) and Arduino (http://arduino.cc/en/main/software). Once I had the latest versions running on my computer, I was able to get hacking and coding. I pulled down some test code just to try getting code from my computer to by Arduino board. For the Arduino side of things, I’m using the Arduino Duemilanove. It turns out that I had an old version of Processing and Arduino already running. So I had to make some changes. Make sure you have the right item selected in the Tools > Board menu. If you have an Arduino Uno, you’ll need to choose it. Also, newer Arduino Duemilanove boards come with an ATmega328, while older ones have an ATmega168. To check, read the text on the microcontroller (the larger chip) on your Arduino board. Once I updated my software, and made the changes above, I was able to get coding. I’ve since written lots of code. And I also started collecting Local Resources. I’ll definitely be posting more resources as we go – in the meantime, if you’ve got any questions or curiosities, post them in the comments below!